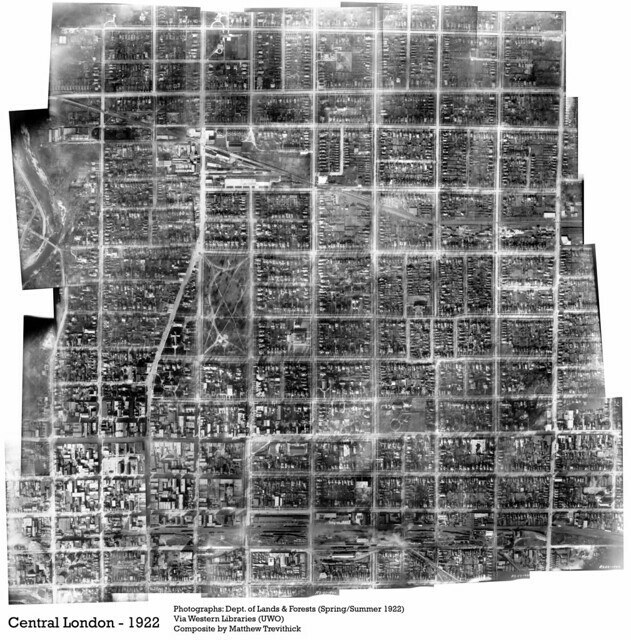 Came across a large cache of aerial photography of London, Ontario via Western Libraries yesterday. The one set that stood out for me were the ones from 1922 (the earliest ones they had.) They were photographed at an approx ratio of 1:3,200, so they were fairly low to the ground and captured quite a bit of detail. Being the kind of person I am (one who wastes a lot of time doing silly stuff like this..) I decided to try to stitch them together to create a large composite. Problem was, the individual photos were plagued with light leaks and dark corners, so it was fairly tricky. The photos may not line up completely, but I tried my best to keep the city blocks looking proper as they are in the individual frames. I plan on adding to it (there are quite a few more stretching as far as Huron to the north, Wonderland to the west, Clarke Road to the east, and Commissioners/Gore Road to the south. Here’s the Central London portion. UPDATE: March 29, 2015 — Embedded below is a Zoomify version of the above photo. Click here for a bigger view.